Shelves of lingonberry jam and Wasa crackers at the markets near my summer job reflect the large Swedish community that settled in Jamestown, New York starting in the 1840s. By 1930, approximately 70 percent of the residents in Jamestown had Swedish ancestry, according to a report from the Chautauqua County Historical Society. Many of the early immigrants were woodworkers in the city’s furniture factories. Every summer, a local Scandinavian Festival pays homage to this heritage by celebrating all things Swedish, from the Vikings to Dala horses. After clumsily painting a wooden chicken, I tramped through a field of puddles to the food tent, where I feasted on home-made Swedish meat balls (spicier and less rubbery than those at Ikea), potatoes mashed with rutabagas, cucumber salad with dill, and a mouth-puckeringly sour assortment of currants and other fresh berries with plain yogurt. Somewhat intimidated about what to make, I chose a Six Layer casserole from the chapter on “Hot Dishes,” as it looked like promising potluck fare. I should have used a deeper dish than a 9-by-13-by-2 inch standard baking pan, as the ingredients didn’t really pile into layers. I persevered through my somewhat deconstructed layers and decided to add chopped fresh dill for more flavor. 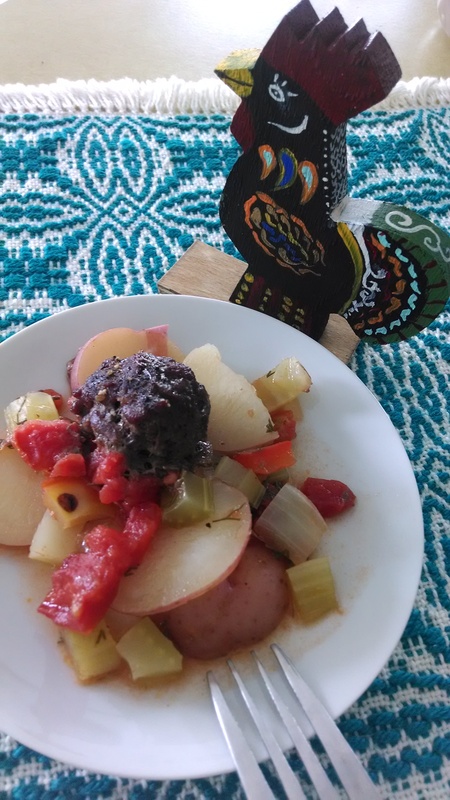 The meatballs browned too much on top, but everyone liked the colorful mixture of potatoes and vegetables underneath. Next time, maybe I’ll tackle Lefse (pancakes made with finely mashed potatoes) or Company Jell-O (a red color with bananas sliced into it). For Lutefisk, dried cod which has to be soaked in lye and then boned and boiled, I’ll wait for the next festival! Oil the bottom of a casserole or other deep baking dish. Place the potatoes on the bottom. Then arrange the other vegetables on top in layers. [I sprinkled each layer with a little dill, but this is optional]. Season the hamburger with salt and pepper. Form into meatballs [I made 12] and arrange on top. 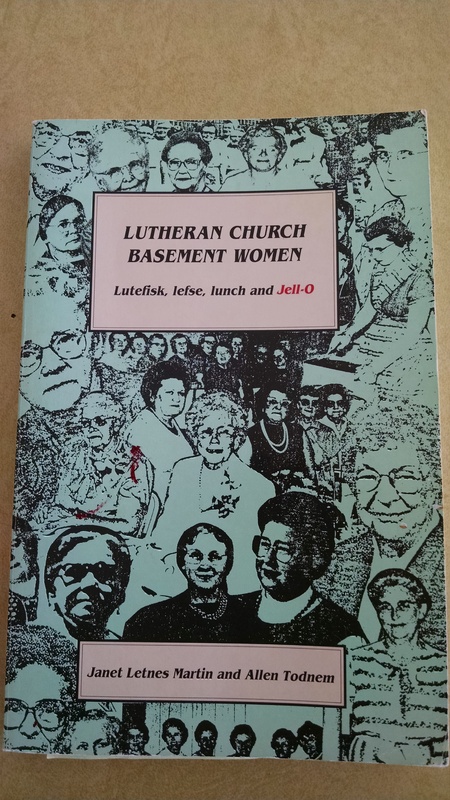 Note from the book: If you skip the green peppers, which are optional, you only have a 5 layer hot dish but Lutheran Church Basement Women still call it Six Layer Hot Dish. This entry was posted in cookbooks, Food, History and tagged celery, hot dish, Jamestown, Lutheran, meatballs, New York, onion, potato, Scandinavian, Swedish. Bookmark the permalink.